Gus lives in a big park in the middle of an even bigger city, and he spends his days with Ida. Ida is right there. Always.Then one sad day, Gus learns that Ida is very sick, and she isn’t going to get better. The friends help each other face the difficult news with whispers, sniffles, cuddles, and even laughs. Slowly Gus realizes that even after Ida is gone, she will still be with him—through the sounds of their city, and the memories that live in their favorite spots. Writing this book review is hard because every moment that I go into my mind to think about this book, a tear escapes. I have no idea how a child can read this when a 23 year old adult is crying halfway through the book. 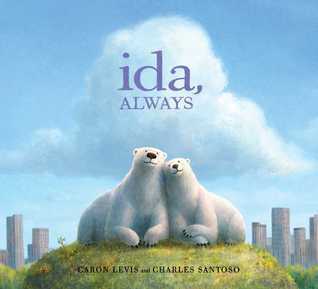 For my first picture book review, I am glad that Ida, Always was my first. This book dicusses the topic of death and the impact that it can have on someone and by someone I mean Gus, the polar bear. This story was inspired by two polar bears who were the best of friends. Then one day, Ida fell sick and Gus's world was put upside down. Overall the book was just so well writen and put together, but what really captured my interest was the illustrations. They really set the tone and mood for the story. It also really allowed the reader's emotions to match what Gus was going through. Like mentioned above, this book does talk about the idea of death but it does it in a way that it is perfect for kids. It is suttle, it talks about how hard it is, but then how just because someone is gone doesn't mean they have left your heart. This is a great read. I would reccomend it for kids five and older. As well as adults. I am glad that I stopped to look at this book and allow it to capture my heart. Levis and Santoso do a brilliant job and this book will have a place on my shelf...Always!